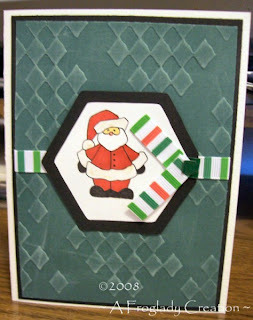 This was s simple card I am trying to use up all the misc Christmas stamped images I have gathered over the years and he was in there :) Sorry I don't know who it is from/by so if you do let me know and I will update the info! I cut around the Santa using my Slice and cut a mat for it also. I colored Santa using my Copic Markers and Saukura pens. Then I layered it onto green cs that I had cuttlebugged and swiped with my white inkpad. Added the ribbon across center before adhering it and then added a snip of ribbon to the santa panel itself using this green clippy thing I folded over to hold the ribbon.